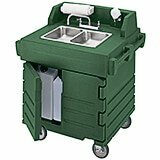 Provide ease of washing hands to your staff or customers where there is no any water hookup nearby by getting our high-quality hand sink carts. Designed for easy portability, our hand sink carts feature four casters with brakes for convenient transport from one place to another. 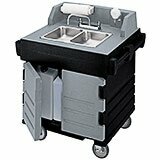 Our hand sink carts have two stainless steel sinks, wherein one runs hot water and other one cold. When placed in any food preparation area, they can assist in keeping your hands, utensils and other tools clean. 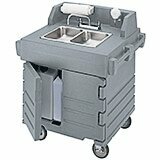 Our portable hand sink cart models are designed with thick insulation for added strength and durability. Each unit comes with a paper towel holder and soap dispenser for user convenience. Intended for hand wash only, these carts do not contain any filter for water purification to use for consumption purposes.